Manage a fleet of devices with a cloud-based EMM solution that increases business efficiency and secure corporate data. Knox Manage can manage any Adroid, and Window 10 device. This is a significant enhancement that many customers waited for. From this release, IT admins can remotely upload and distribute files to selective targets per Organization/User/Devices, or to all levels. Once deployed, end users can access files in the Content which is the menu in the KM agent. Native application for each content should be run for user to view the files. To date, Offline unenrollment code is available so long as the device is available in the Admin console. IT admins had to make sure to jot down the code before deleting; if deleted accidently, it was impossible to find the code. From this release, IT admins can find Offline unenrollment code in Audit Logos even if the device has been deleted from the Admin Console. Dialer app has been added under the Utility Applications list in Kiosk Wizard components. 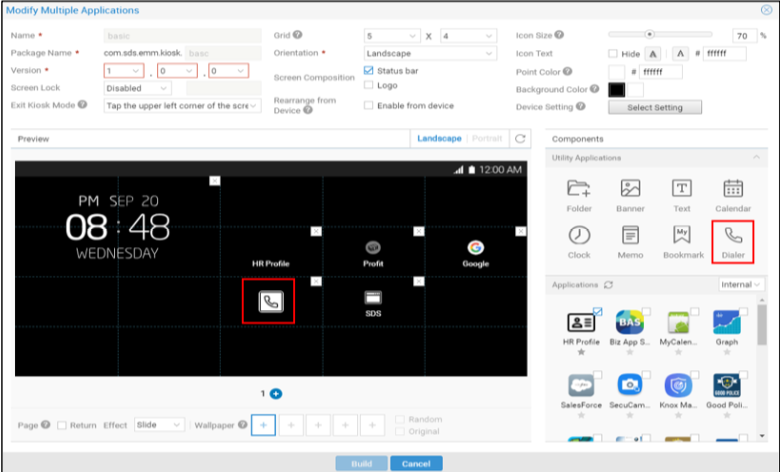 IT admins can drag and drop Dialer app to the kiosk screen, and click the phone dialer icon to default set to automatically run the app. To date, IT admin could either allow or disallow the entire access to the Device Settings of kiosk devices. 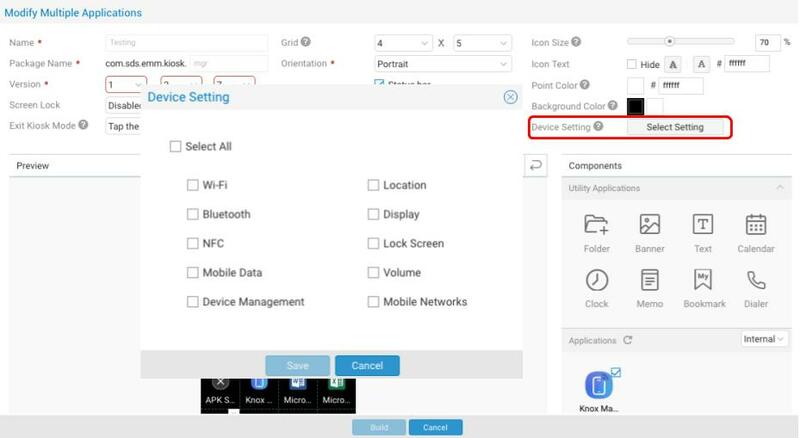 Now, IT Admins can configure which options from Device Settings to be available in kiosk devices. The admin console menu has been updated for better user experience. Click here for better understanding. SIM lock option is available in the Profiles menu. If SIM lock option is enabled, IT Admin should set the default SIM PIN and the new PIN. Default SIM Pin: IT admin should firstly check if SIM cards have default PIN set by operator. In that case, the already existing SIM PIN must be written. New SIM PIN: Write a 4 to 8-digit number as to unlock SIM card. This field can be used to change a PIN number as well. If device is SIM-locked, user must enter this PIN number to reuse the SIM card. When the device is unenrolled from KM, the SIM PIN number reverts back to its original one. IT admin can prohibit end users from adding email accounts to the preloaded or Samsung email apps. If set to Disallow, then any email accounts cannot be registered. 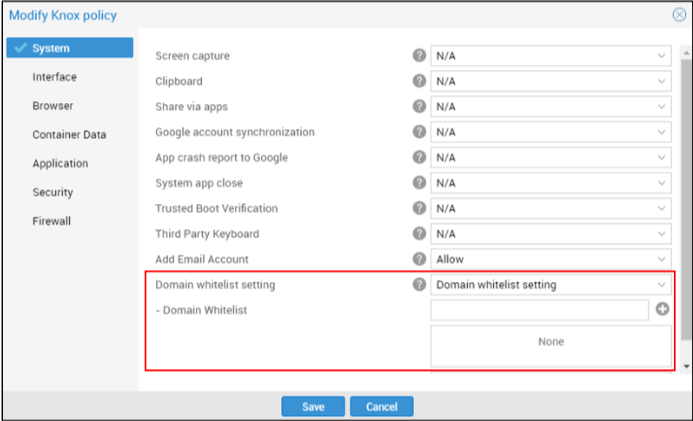 If set to Allow while domain whitelist is selected at the same time, only accounts of the whitelisted domain can be added. The below two open APIs are available for Samsung Electronics B2B shop. Tenant creation – The tenant is created and password is updated in initial login-in. The IMEI management option has been renamed as Limited Enrollment. KM can now allow only the predefined devices be enrolled. 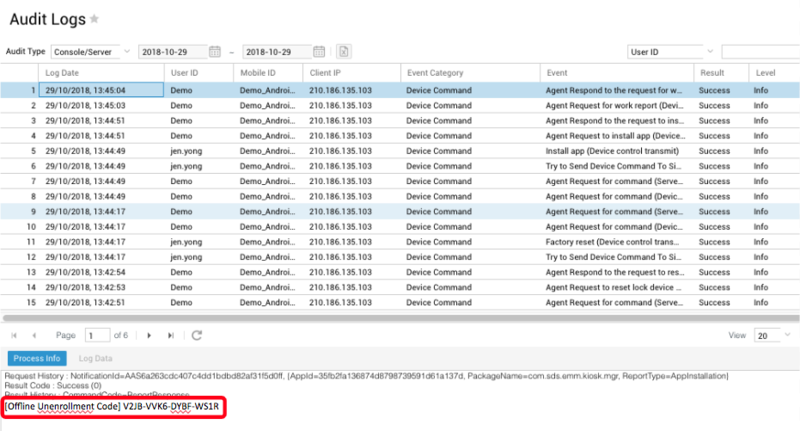 IT admins can add devices by IMEI or Serial numbers, or in bulk using excel file. Device status “Activated/Deactivated” has been updated to “Enrolled/Unenrolled” for clear messaging. The enrolled device icon and the text description is added in user/organization, adminstrators menu. etc. The cloud connector always applies when IT admin integrates AD/LDAP or register CA. Customer does not have to choose whether to use or not. Position & enroll method cannot be viewed from the User & Organization list.